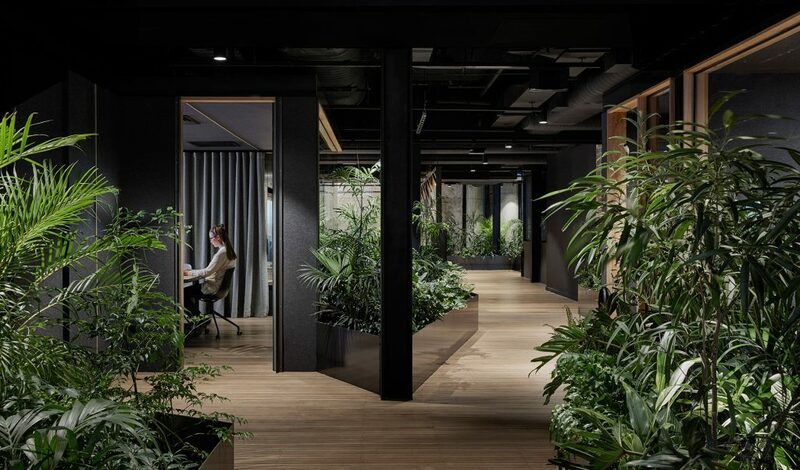 Working at a place like Sling & Stone, where you’re constantly surrounded by people wearing full-frontal crab costumes, cute little robots that give fist bumps, and a Carrie Bradshaw-worthy collection of shoes, it’s easy to get the creative juices flowing. But what happens when you’ve got so many ideas that the idea police are threatening to knock down your door and arrest you for idea-cent exposure? The answer, ladies and gentlemen, is Slack. Thanks to Slack, syncing up on the important stuff — press releases, upcoming events, three-legged cats, interview opportunities — has become as easy, if not easier, than talking IRL (that’s “in-real-life” for my parents, who quite possibly are the only people over 50 reading this blog post). More importantly, Slack is a place to organise your thoughts, and to get work done. Its handy integrations and workflow hacks are a major reason why we’re able to wrap up all of our hard work by Friday afternoon and head to the crustacean-station for a well deserved brew (otherwise known as the Crabshack, our office bar). We have more than 160 Slack channels at the agency. In those channels we collaborate on everything from client work and agency team-building initiatives to Game of Thrones conspiracy theories. Having recently opened our first international office in Wellington, we’re now growing a new microcosm of New Zealand-specific channels. You should have seen the banter when we had to split #general into #syd-general and #nz-general. 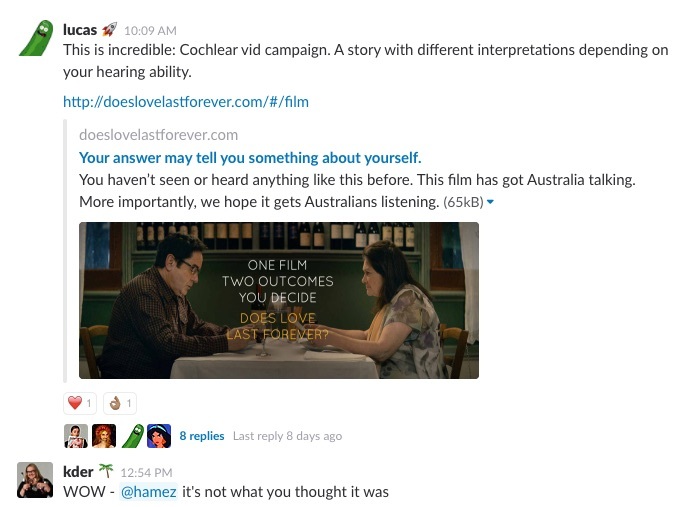 We share Slack channels with our clients, too. The instantaneous nature of messaging and the ability to share files and collaborate makes the client-partner workflow so much smoother, and closer, than relying on email. 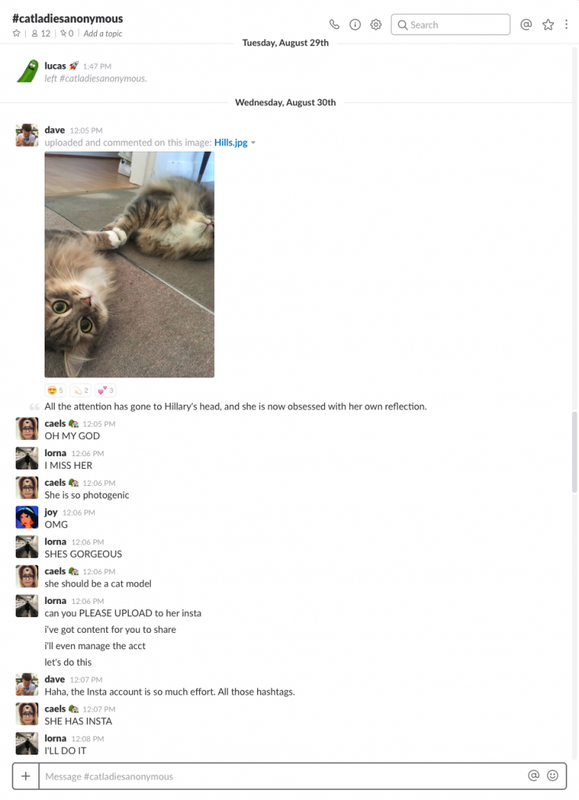 Truthfully, not all Slack channels are created equal. Indeed, any Slinger will tell you there are certain channels that generally get more “Slacktion” than others: more followers, more discussions, more integrations, more unicorn memes. 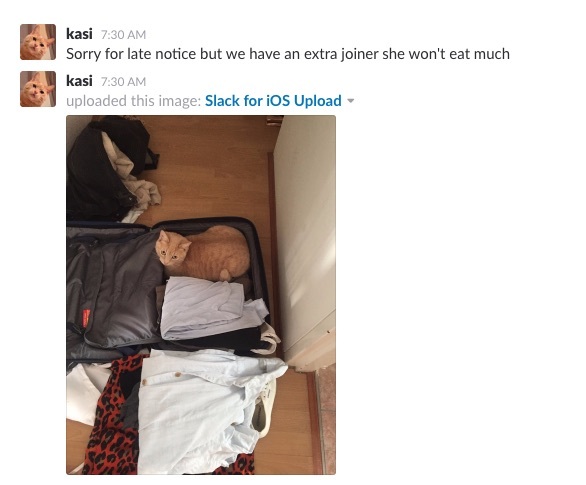 In a surprising turn of events, I have been selected to share a snapshot of the agency’s most cherished Slack channels. So without further ado, here they are. What started out as a humble space to discuss lunch options has quickly expanded to become the heart and soul of our agency. Ripe with passionate burrito banter and the occasional (chicken) nugget of wisdom, it brings a tear to my eye to look back on this channel and see how much our taste in pizza has matured over time. One of the handiest features of #eats is the Lunch Train bot, where you can let your colleagues know where you’ll be ordering lunch in case anyone wants to ‘hop aboard’ the order. Other, more socially acceptable people find inspiration in art, the environment, or creative PR campaigns happening around the world. If you’re in the mood to inspire or be inspired, you’ll find all the ammo you need on #inspiration. With so many bold and beautiful activations happening around us, this channel is the perfect place to start if you’re looking to make great things happen. On a Tuesday morning during Game of Thrones season, it’s not uncommon for our office to be as quiet as the Silent Sisters, with heads down and fingers busy typing our juicy conspiracy theories on #got7. Between the drama of the show and our vivid imaginations, things can sometimes get as heated as Zombie -Viserion’s blue fire. 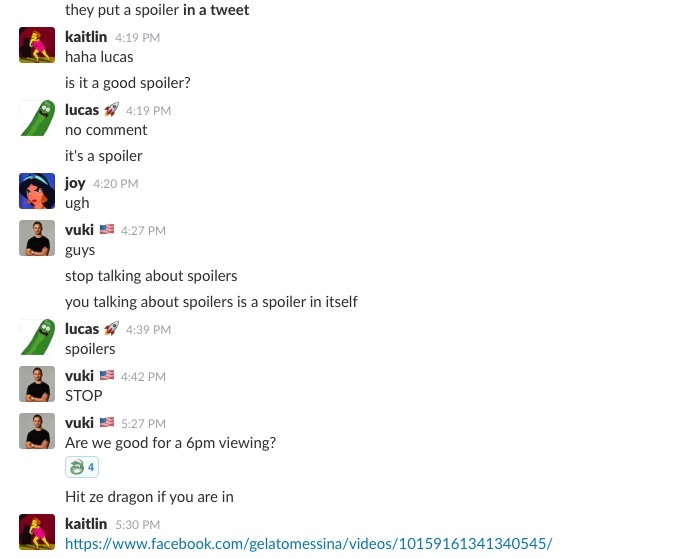 One of my biggest fears in life (besides a world without cats) is finding out what happens in GoT before seeing the episode in question — which is why I was extremely thankful that we integrated a Slackbot to the #got7 channel, reminding us to stay off social media every Monday until we’ve had a chance to see the latest show! I know what you’re thinking and the answer is no, this isn’t a channel for people with arm injuries who desperately need a holiday. It’s where we chat about the Sling & Stone offsite, which some absolute legend decided to dub “Sling Break” (somebody give that person a raise!). With this year’s offsite approaching fast, #slingbreak17 is about to see a spike in activity. It comes in handy to have a channel exclusively to discussing travel, accommodation, packing, balloon fight etiquette, how much cheese to order, and other important prep for the event. If you’re one of those people like me who prefers cats to humans, don’t seek professional help — just head straight to #catladiesanonymous, where cats are worshipped more than they were in ancient Egypt. As the creator and self-appointed moderator of this channel, I wish I could say #catladiesanonymous wouldn’t be possible without the Slingers who post here regularly. But truthfully, we all know who the real stars of the show are: Coco, Peaches, Hunter, Hilary, Kevin, Malcolm-formerly-Franklin, Misu, and Sonny. Shout out to the S&S cats! Truthfully, one blog post isn’t nearly enough space to explain the beauty that is the Sling & Stone Slack, but I’ll leave you with this: Our philosophy here is ‘work hard, play hard, and don’t take yourself too seriously,’ and Slack makes it easy to accomplish all of the above.